of which Sushant is one of the National winners. 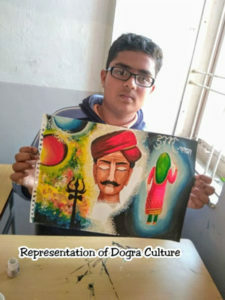 The competition was held on 2 nd Feb, 2018 &amp; he with his enthralling &amp; exquisite painting left everybody in awe. He is being invited by the concerned organisation for a Trip to Delhi from 4 th to 6 th July, 2018 to be honoured &amp; felicitated by distinguished dignitary from the Ministry of Culture or Ministry of Tourism. The school always adheres to its motto of enriching our children in their talent &amp; that is the reason we provide them plethora of opportunities to be availed of which always yield positive result.